APRJC CET Inter Admissions 2019-20 counselling,Certificates verification dates, aprs.cgg.gov.in, apresidential.gov.in. 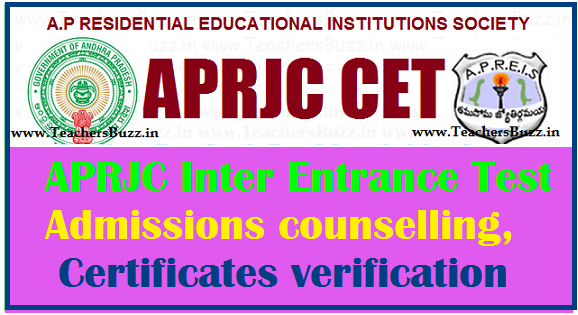 APRJC CET Admissions Counselling, Certificates Verification dates, list of Documents to be produced at the time of verification/Shortlisted candidates for 1st phase counselling: APRJC CET Admissions Counselling, Certificates Verification dates 2019 and list of Documents to be produced at the time of verification/Shortlisted candidates for 1st phase counselling: Andhra Pradesh Residential Educational Institutions Society had released the APRJC CET 2019 notification on March 14, 2019 and Online applications were received from 14-3-2019 to 14-04-2019 from the eligible candidates who were appeared the SSC March 2019 exams from AP for admission into 1st year intermediate in APR Junior Colleges for the academic year 2019-2020. The APRJC Entrance exam was conducted on 09-05-2019 and results were declared in May 2019. The candidates who were appeared this entrance exam, they were checked the results. The APEIS official has prepared the shortlisted candidates and kept on its web portal. So, the Hall ticket Numbers of the shortlisted candidates for counselling are available on the websites: http://apresidential.cgg.gov.in/indexedu3.aspx, http://aprs.cgg.gov.in. https://aprjdc.apcfss.in/ Candidates has been shortlisted based on merit in the Entrance Test. Candidates will be called for counselling as per schedule for allotment of seats for admission in the ratio of 1:5. The counselling will start from June 2019. APREIS has decided to conduct the 1st phase APRJC Admissions counseling at the specified venues as per the announced schedule for admission of students into I year intermediate for all A.P.R. Junior Colleges for the academic year 2019-20. To attend the APRJC 2019 Intermediate Admissions counselling the students download the aprjc result sheet/ counselling letter from the official website http://aprs.cgg.gov.in/ or http://apresidential.cgg.gov.in where you can find the time and venue of APRJC Admissions Counselling 2019-2020. When going to participate in the aprjc counselling, candidates must bring their original certificates with them as they are verified at the time of aprjc counselling. You must keep two xerox copies along with originals of your documents also. Tags : aprjc 2019 counselling dates, schedule, required documents for aprjc 2019 counselling aprjc 2019 counselling dates certificate verification schedule ,aprjc cet admission counselling centers dates 2019 - 2019,fee details,colleges list, aprjc certificate verification dates 2019 - 2019, 1st phase counselling, 2nd phase counselling ap residential junior colleges,aprjc counselling letter download from the official website.